The Mead Kitchen's Dan Cook. For more information, visit TheMeadKitchen.com, SFMead.com, BayAreaMashers.org, and IUHOakland.com. Tens of thousands of years ago, the hunters and gatherers of the Paleolithic Age discovered that beehives produce honey. Soon after, they started storing the sweet, syrupy liquid in their water bags. Wild yeast in the air eventually caused the honey in these bags to ferment — a process that inadvertently produced what might have been the first-ever alcoholic beverage. That is, at least, how Dan Cook imagines humans first stumbled upon mead. "Whoever owned that bag probably became the shaman of the tribe," said Cook, who runs The Mead Kitchen (2323 Fourth St., Berkeley). "It was like magic." While mead may be the oldest drink known to mankind — Cook said there's archaeological evidence that it was produced in ancient times — the drink has become increasingly popular in recent years. In fact, mead makers across the country say the honey brew is experiencing a revival, and the Bay Area is no exception. In addition to new commercial meaderies that are manufacturing and selling their meads regionally, such as The Mead Kitchen and the San Francisco Mead Company (1180 Shafter Ave.) in the Bayview neighborhood, Bay Area homebrewers say they are increasingly experimenting with mead making. "It's something old, that's also very new," said Cook, who started as a homebrewer and has been making mead for about sixteen years. According to a recent report from the American Mead Makers Association, in 2012, US meaderies reported selling an average of 404 cases of mead per company — a number that doubled to 823 in 2013. And while American meaderies reported average gross sales of $48,624 in 2012, that figure jumped by 130 percent to $112,000 in 2013. That increase, the association said, makes mead the smallest — but fastest-growing — sector of the alcohol industry. The association lists more than two hundred professional mead makers on its website, with nineteen located in California. "It seems like there's a new meadery springing up every day," said Sarah Benary, who runs the San Francisco Mead Company with her husband Oron. "It's not just a fad. It's this actual genre of drink that is being revived." 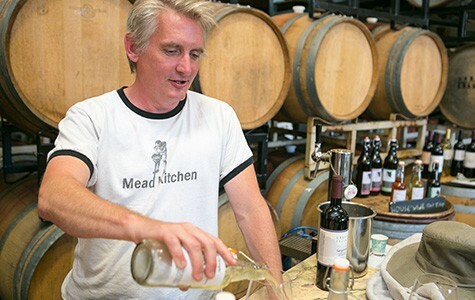 The Mead Kitchen, which Cook runs with his business partner Paul O'Leary, made its first batch of mead in December 2012 and started distributing the product in October 2013. The Mead Kitchen's drinks are now available at the Lanesplitter Pizza restaurants in Berkeley (2033 San Pablo Ave.) and Oakland (4799 Telegraph Ave.), the East Bay Spice Company (2134 Oxford St., Berkeley), the Albany Taproom (745 San Pablo Ave., Albany), and the Zeitgeist (199 Valencia St., San Francisco). The business shares space with Urbano Cellars Winery in West Berkeley and is in the process of expanding at that site. 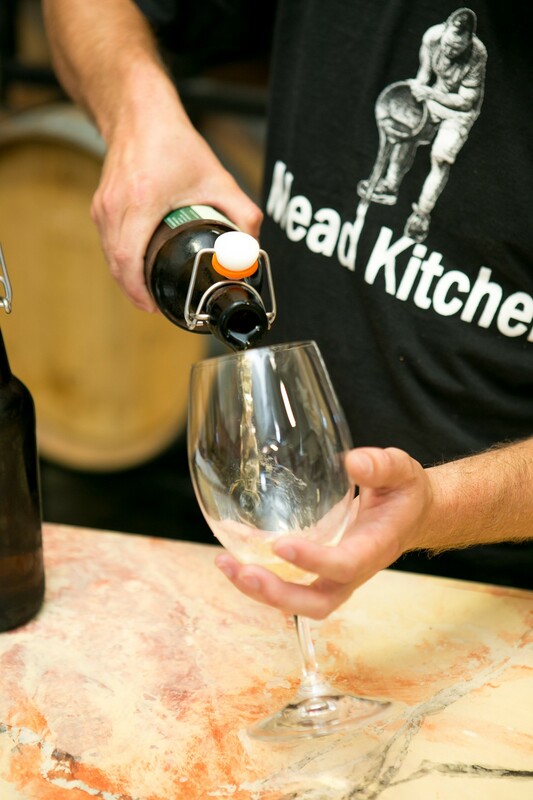 O'Leary estimated that the Kitchen has made about 2,500 gallons of mead since launching. Contrary to some common misconceptions, mead is not always an overly sweet drink similar to a dessert wine. The only thing that all meads have in common is that the sugar used during fermentation comes from honey (whereas wine is made from grapes or other fruits and beer is made from grains). Meaderies can use a wide range of fruits or spices for flavoring at various stages in the process. While people often think of mead as "honey wine" and while some mead varieties are in fact very sweet, they can also be quite dry, and some are carbonated and served chilled, much like beer. 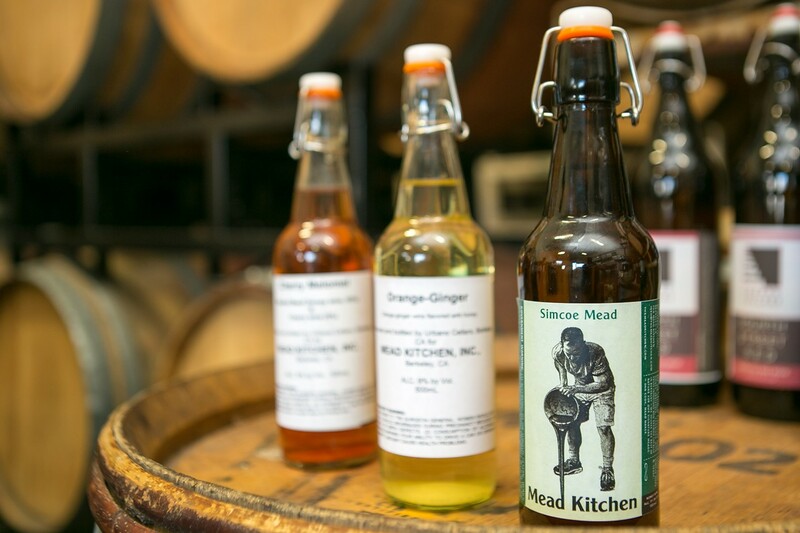 One of The Mead Kitchen's most popular products is a variety that beer drinkers can appreciate — an orange and ginger mixture that Cook has been brewing since he first started making mead. 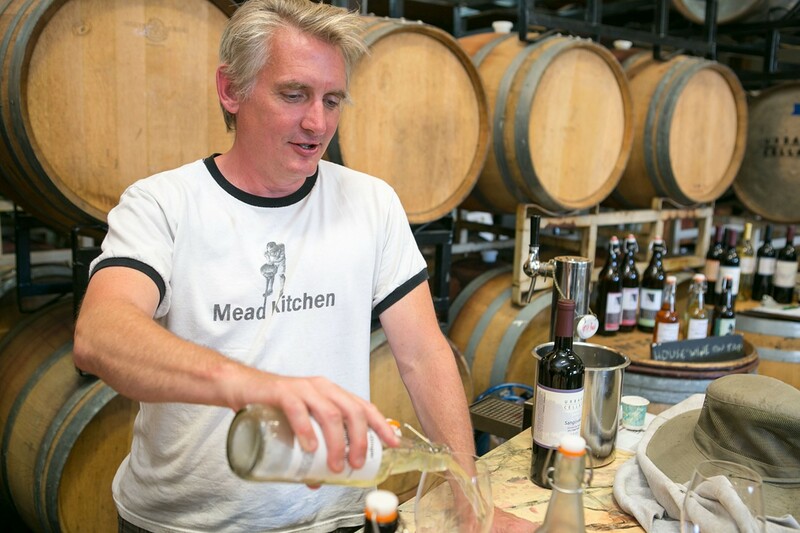 "If you go to a handful of mead makers, they are all totally different," said Benary. "That's really exciting to drinkers." Cook said a number of factors appear to be driving mead's popularity locally, including increasing interest in gluten-free foods — for those who are allergic to gluten, mead can be the best alternative to beer — as well as growing awareness of the importance of honeybees, which have been dying at alarming rates. The HBO show Game of Thrones, has also helped put mead on the map, Cook said. And in the East Bay, as both homebrewing and urban beekeeping have become increasingly trendy, more residents have tried their hands at do-it-yourself mead making. "All the brewing groups have had this huge influx of people," said Will Bauer, former president of the Bay Area Mashers Homebrew Club. Bauer, who lives in Temescal and has been brewing mead for ten years (and keeping bees for two), said that there are a lot of opportunities for experimenting with mead and that mead drinks can be very easy to make. He sent me a copy of "Joe's Ancient Orange Mead Recipe" — which he said is "foolproof" for novices — that involves dissolving honey in warm water, mixing in raisins, clove, cinnamon, and bread yeast, and essentially leaving the concoction in a dark place for two months. And with enough practice — and patience — the results of homebrewing can be very tasty. "I turn people on to mead a lot, and they're often really blown away," said K. Ruby Blume, founder of the Oakland-based Institute of Urban Homesteading, where she teaches classes on winemaking and mead. "They're so often like, 'I've never had anything like it.'"